1. Is SES actually controlled? If siblings are being compared, as opposed to twins, then SES will differ between them. Also, it's not even clear that twins will have the same SES, because they may live in different neighborhoods if for example the parents are divorced. 2. 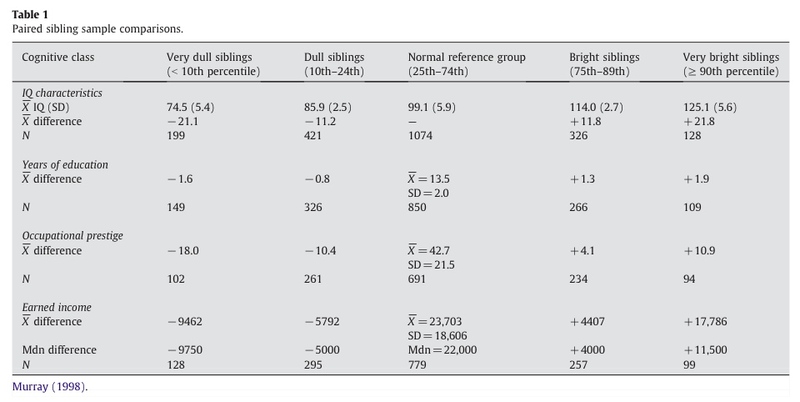 Even if SES is controlled for, it is not clear that IQ is the causal factor in later SES differences between the sibs. IQ may correlate with other causes due to nonshared environmental or genetic correlations between IQ and SES-influencing traits. By SES I mean the childhood SES experienced by both siblings. So, yes, it's controlled. 3. but somehow are not IQ, and yet cause differences in educational achievement, earning power, etc. "SES does not predict college success, SAT does..."
What is "college success"? Once again Steve underhandedly and stupidly substitues a vague generality for something very specific. Here he has substituted "college success" for gpa. "If we use a heritability range of .7-.9..."
Who is "we"? Is that the royal "we"? "and over a large range of childhood environments..."
What is a "large range"? "typically have IQ differences of around 5-8 points"
What the f does "typically ... of around" mean? More psychobabble from professor chinaman. Steve claims that he does not reify IQ yet he here claims IQ is a cause. How can something which is not a real thing be a cause? Perhaps Steve does not know what "reify" means. It's been a long time since you've added anything constructive to the discussion here. I don't get the sense that other commenters are interested in your opinions. Also, your latest anti-semitic comment re: Sergey Brin is not appreciated. Any more of this and you will be banned from further comments on this blog. Perhaps it will help if I clarify what I'm talking about with a sib design not controlling for parental SES. My parents were of low income when they raised my older brothers, but rather well off by the time I was raised. It's not reasonable to say that my brothers and I had the same SES. "Do you have a plausible model"
I don't have a complete model here, but I have some ideas for how this could work. For example, imagine that a student ends up hanging out with a group of friends that value good grades and succeeding at school. This will probably increase their IQ a few points (see the work of Kindermann on that note), but it will also have other positive effects which boost later life outcomes (e.g's a good work ethic, better networking group, a greater familiarity with upper class norms). If those other positive effects (which are correlated with IQ due to having the same nonshared environmental cause) work to improve later life outcomes, then we might mistakenly give the credit to IQ. I think when people say that IQ causes something they're saying that, whenever other things are controlled for, whatever IQ is measuring is responsible for it. Ben I think your SES history is a rare case, so I doubt it changes the overall result. Also, I suspect any up-down movements in SES largely average out -- for every family that gets rich in time to help the 2nd child there is a family that moves down in SES, handicapping the 2nd child relative to the first. In any case, why would this effect make high IQ kids systematically more successful than low IQ kids (which is what the data suggests)? Family 1 has kid 1 (adult IQ 90, annual earnings $45,000) when they are lower middle class and kid 2 (adult IQ 110, earnings $55,000) when they are upper middle class. Family 2 has kid 1 (adult IQ 110, earnings $55,000) when they are upper middle class, and kid 2 (adult IQ 90, earnings $45,000) when they are lower middle class. The conclusion of this 2 person microcosm of a sib study would be that SES doesn't matter for IQ/earnings. Note that averaging out of SES makes no difference. Of course you don't get it. Nothing "constructive" can be said within this "discussion" any more than something constructive may be said within a discussion about NASCAR or professional wrestling. a not so smart man obsessed with IQ. But averaged over a large sample, why would SES changes help the high IQ kids and not the low IQ kids? Also, since most sibs are born within a few years of each other (the average age difference has to be 5 years or less, I would guess), it's hard to imagine most families experience a material change in SES during that period. Most sibs will experience a large overlap of SES experience. If SES boosts both IQ and life outcomes, then the higher IQ sib will tend to be the one who was raised under the higher SES. Comparing twins reared together would mostly avoid this. This only works for you if the SES effect on IQ is huge and applies when one sib has only a few years more under better SES conditions. 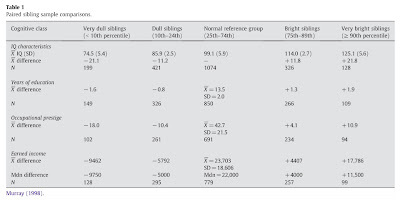 But we know that the heritable part is > .5 of variance and that adoption/twins studies show that SES (as opposed to non-shared E) has only a small effect even when comparing two very different families. So I think your effect is tiny. Hmm, possibly. I would note that studies which establish a small C effect (and implicitly a small SES effect) are based on how much total population variance can be explained by C.
In contrast, there's a much smaller "pie" of variance when we're comparing sibs, because C will have no effect, and G's effect is cut in half (since they'll share half the genes). Therefore, smaller environmental diffs between sibs will matter much more in this design than they would in a population-representative twin study. So it might not make sense to use those twin studies to reason about variance in these sib comparison studies. On the other hand, the SES differences will be smaller as you point out, so they might not have much of an overall effect. So I don't see how we can be certain how much this effects the study. The shared environmental correlation between IQ and Income is estimated at 0.14. The genetic correlation is estimated at .20. Isn't SES the affinity and IQ the acuity [err, stabilizer]? The success function is from the space defined by the semidirect product of SES and IQ. A little weird, though, because the eigenvalues of IQ !=1, so there is some interaction between the two, and by evidence not abelian. At least that is how I think of it. Do you think that the success function is compositional SES(IQ(x)) or IQ(SES(x)) ? I take issue with your concept of socioeconomic status-SES (or what seems to be the new trendier term "socioeconomic position-SEP" ). SES/SEP is not simply a measure of income but also it should incorporate a measure of education. For example most people would consider a kid who was being raised by parents who are in a higher education type pipeline (e.g. med students, law students, earning a PhD, or doing a professional on the job training such as law clerk or medical residency)to be of much higher social class than a kid who was being raised by parents who had much higher paying union jobs in factory or were truck drivers. So I highly suspect that your parents were actually higher social class (i.e. engaged in higher education-associated career tracks) even when they were "low income parents". My sibs and I were quite stable: one got +1 sd pretty consistently on standard tests, two got +2, one got +3. We all got read to on laps, lot of books in the house - SES the same. Heredity is what's left, it seems to me. Good point. There wasn't as much of an SES change if educational (prospects) are taken into account.